December 14, 2017 - The 2017 M.T.H. 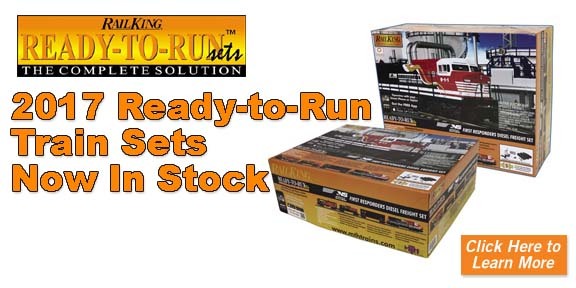 RailKing O Gauge Ready-to-Run train set lineup is in-stock and ready for pickup at your local M.T.H. Authorized Retailer. Click on any of the item numbers to the left to learn more about each set or visit HERE to get all the details on the 2017 Set Program, options for control, accessories and add-ons and a whole lot more. Sets can be purchased from your local M.T.H. Authorized Retailer by clicking on the Product Locator tab on each set's detail page or ordered directly from M.T.H. by clicking on the Add to Cart button.